When looking for wedding gowns Northwest Illinois brides sometimes search far and wide for their dream dress. Brides can try on a hundred gowns before finding the right one, going from store to store to store. Then brides also have to shop for bridal accessories, bridesmaid dresses and tuxedos. It can feel like shopping for the wedding may never end, and the search may become frustrating. Since 2011, Northwest Illinois has had Adore Bridal & Specialty to offer them a one-stop shop for all things bridal. Whether you are focusing on getting the dress, need the perfect accessories or want to dress your bridal party, we have the styles and stylists to please any bride. You can read through our past Adore bride testimonials or see our available styles on Pinterest, but internet research can only go so far. 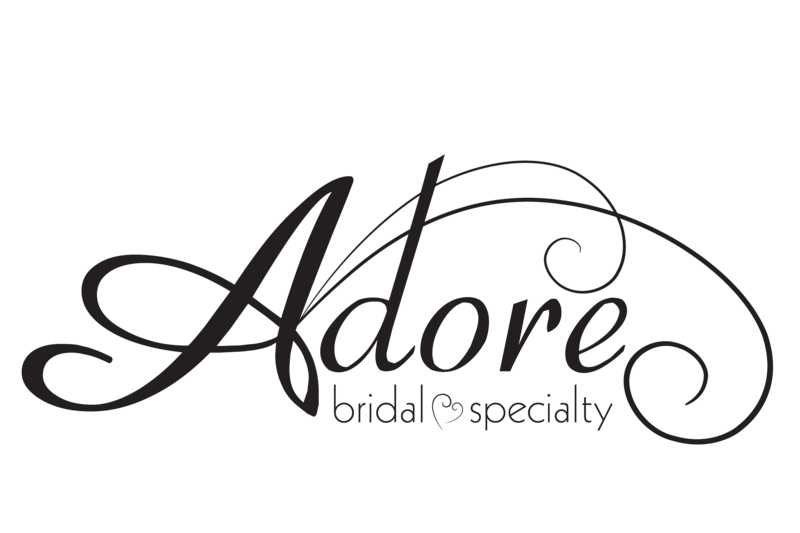 Before you buy a gown, tuxedo or bridal shoes that look gorgeous on the web, schedule an appointment with Adore Bridal. Our stylists are here to give you the bridal experience. Before your appointment, your stylist will connect with you so she can understand your dream wedding look as well as you do! Then she will pull a few gowns that are perfect for your vision, ready for you to try on during your appointment! Our stylists are known for finding a bride’s dream gown before they walk in our door, so let us do the same for you! During your appointment, we can also show you our wide variety of bridesmaid dresses, tuxedos, bridal accessories and bridal shoes, which will help you complete your dream wedding look. When looking for bridal accessories, bridesmaid dresses, tuxedos or wedding gowns Northwest Illinois brides should look no further than the unique, personalized shopping experience at Adore Bridal. Contact us online or call 309-291-0838 to schedule your appointment today, and you won’t regret it! Since 2011, we have been providing dresses, accessories and tuxedos for weddings Northwest Illinois brides Adore, so let us do the same for you.